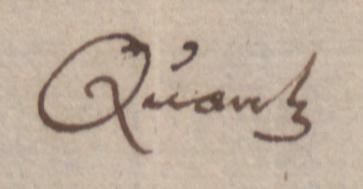 Much is known about Quantz’s life because he wrote an autobiography (published in 1755 by Friedrich Wilhelm Marpurg) and a handwritten continuation in 1762 for Padre Martini. His life may be divided into three main periods: his youth, his life in Dresden and his life in Berlin. Next to it he made an important journey abroad to perfect his musical education. Johann Joachim Quantz was born in Oberscheden on 30th of January 1697 (entered as Hans Joachim in the baptismal register of the St. Marcus, Scheden, 6th of February 1697). He was the son of Andreas Quantz (d 1707), a blacksmith, and Anna Ilse Beuermann (d 1702). He spent his youth in Merseburg. His uncle Justus Quantz, who was a musician at Merseburg, became his guardian after the dead of his father. Unfortunately Justus Quantz died a few month later. His uncle’s son-in-law Adolf Fleischhack (who was the successor of Justus Quantz) then took pity on the boy and gave him a extraordinary broad musical education during five years. He learnt to play a lot of instruments: in particular the violin, oboe, trumpet. And further horn, recorder, bassoon, cello, viola da gamba, cornetto and sackbut. But not the flute, maybe because the instrument was not yet very popular. The recorder was more commonly used. He took harpsichord and composition lessons with Johann Friedrich Kiesewetter (d. 1715). After completing his apprenticeship, he lived for another couple of years in Merseburg as a musician. During a three month mourning period at the Merseburg court in 1714, because of the death of the brother of the Duke of Saxony-Merseburg, Quantz temporarily left Merseburg to find a more provocative job in Dresden. Dresden was then the cultural centre under Frederick August II, Elector of Saxony and king of Poland. He started to play in a town band in nearby Radeberg. Since the town was destroyed by fire, he moved to Pirna, where he found work under the town musician George Schalle (1670 – 1720). In Pirna he came to know the director of the Dresden town band Gottfried Heyne (d. 1738), who employed him when additional players where needed for weddings. His acquaintanceship with Heyne became the first step towards a position in Dresden. In Pirna in 1714 Quantz first encountered the concertos of Antonio Vivaldi (1678 – 1741). He wrote in his autobiography (p. 205) the following: “as a then completely new species of musical pieces, they made more than a slight impression on me. I did not fail to collect a considerable assortment of them. In the future the splendid ritornellos of Vivaldi provided me with good models”. In September 1714 Quantz returned to Merseburg and stayed there until March 1716. In 1716 he joint the Dresden town band of Heyne. He went to Vienna in 1717 to study composition with Jan Dismas Zelenka, who was a pupil of Fux. In 1718 he became oboist and violinist in the Polnische Kapelle in Dresden, an ensemble of twelve players. The Polnische Kapelle spent the half of each year in Warsaw. In the 1720’s the recorder was losing ground to the traverse flute. Quantz soon saw the great possibilities of the traverse flute. Because there were more experienced oboists in the orchestra, Quantz decided to chose for the traverse flute as his main instrument. He began to concentrate on the flute, performing more and more on the instrument. He took lessons for four months with Pierre-Gabriel Buffardin in 1719, the first flautist on the Dresden court at that time, “in order to become familiar with the true characteristics of this instrument. We played exclusively fast pieces of music as this was the forte of my master“. At the same time he took lessons from Pisendel in composition. The Dresden orchestra was very famous at that time. Quantz came into contact with the musicians Heinichen, Lotti, Pisendel, Veracini, Hasse, Ristori, Zelenka, Sylvius Leopold Weiss, Richter, Hebenstreit, to name a few. In the 1720s there were less compositions for the flute available, so Quantz decided to compose for the flute himself. He taught himself by studying music of other composers. In particular the music of Pisendel, Vivaldi and Montenari had a great influence on him. He gradually became known as the finest flutist in Europe. In 1723 Quantz made a journey to Prague and he took part in the opera “Costenza e fortezza” of Johann Joseph Fux (1660 – 1741). He heard the famous violinist Tartini. Not long after returning to Dresden Quantz was invited to Würzburg, whose bishop offered him a position as flutist, but he refused. From 1724 to 1727 Quantz made a tour through Europe, made possible and funded by his employer. He visited Italy, France, England and The Netherlands. In Italy he met Francesco Gasparini (1668-1727) and studied counterpoint with him. He remained for two years in Italy and came in contact with many composers and musicians during his journey. He met Hasse in Napels and Alessandro Scarlatti in Rome. He was in Bologna, Modena, Milan, Pistoia, Venice, Florence, Turin. After his visit to Italy Quantz went to France. Here he met the famous flautists Jacques Christophe Naudot and Michel Blavet. In the spring of 1727 Quantz made a short trip to England. He visited the opera and surely met Händel who was in London at that time. By 1727 he had become Europe’s premier flute virtuoso. After his return to Dresden Quantz was in March 1728 promoted from the “Polnische Kapelle” to the orchestra “Sächsische Kapelle“, which was also accompanied by a rise of salary. At that time he received a salary of 250 thalers. In 1733 his salary was increased to 800 thaler. On a visit to Berlin the same year (1728) Quantz played for the Crown Prince of Prussia. Frederick was so enchanted that he immediately arranged Quantz to teach him the flute in spite of the objections of his father. During the 13 following years, Quantz will go twice a year to Berlin and later to Ruppin and Rheinsberg to give lessons to the future king. Quantz was also allowed to visit Bayreuth to give flute lessons to the margrave, the husband of Frederick’s sister Wilhelmina. In a letter to Wilhelmina dated 12 Jaunary 1736, Frederick discribes Quantz as behaving like a grand seigneur: “You will find Quantz high opinion of himself the more insupportable in that it is really without foundation. The only way to bring his haughtiness to an end is not to treat him too much like a grand gentleman“. On the 26th of July 1737 he married Anna Rosina Carolina Schindler. Their marriage was childless. From 1741 to the end of his life Quantz was composer and flute teacher of Frederick the Great in Berlin and Potsdam. By then he was well known and respected as a extremely versatile, widely travelled and experienced musician. His annual salary increased to 2000 thalers and additional payment for every composition for the king which was not published in the ordinary way, and one hundred ducats for every new flute. One of Fredrick’s generals, Count Egmont van Chasot, who was an intimate of the king even before the coronation, wrote in his memoires that Fredrick paid Quantz 30 louis for each new concerto, 20 louis for a trio sonata, and 10 louis for a solo sonata. Quantz had every inducement to be so prolific as he was. His service included the duty to give regular flute lessons to the king, to direct and occasionally to take part in the evening chamber concerts, to make flutes and, naturally, to compose new pieces. His performance obligations were limited to the Royal Chamber Ensemble, excluding duties in the opera orchestra. However, his contract also contained a clause according to which his compositions were for the king’s exclusive use, and they could not be circulated outside the court in any way. Chamber concerts were organized in the palace “Sans-souci” at Potsdam. 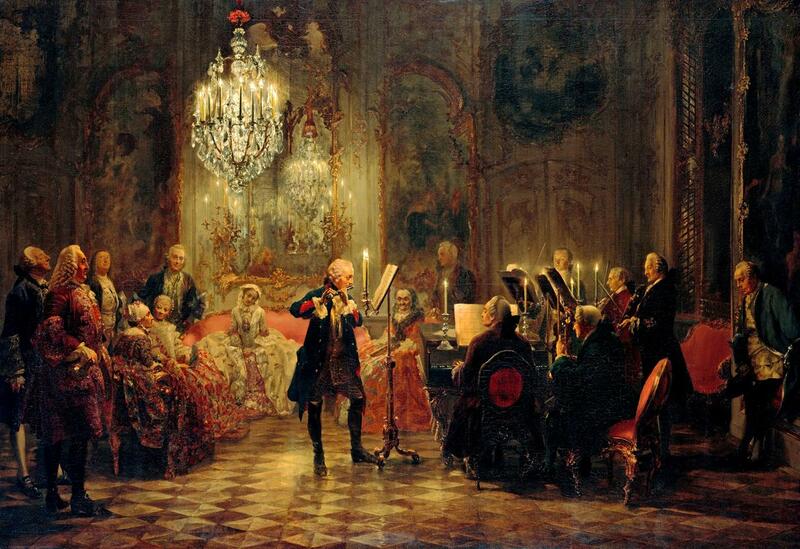 Every evening Frederick the Great played the flute accompanied by his best musicians. The concerts were generally arranged by Quantz, with the assistance of Benda, Graun and Carl Philipp Emanuel Bach, and later Carl Fasch who replaced Bach when Bach went to Hamburg. The king’s concerts generally lasted from 7 to 9. Frederick played six concertos and one sonata without a break during these chamber concerts. Later the number of concertos was reduced. Quantz only participated when a second flute was required. The repertory of the concerts had a tendency to be progressively more restricted. In the end the king played almost only concertos of Quantz, Benda and compositions of his own. Count Egmont von Chasot also wrote a detailed desciption of the royal chamber concerts in his memoires. He mentions the makeup of the chamber group that accompanied the king: “The ensemble consisted of only one first and one second violin (seldom doubled), a viola, a cello, and as clavecin a fortepiano made by Silbermann, the flute, or two flutes when Quantz played with the king. Sometimes one or two castratos or one of the best female sangers of the opera recieved orders and a royal coach for their journey to Potsdam. Only flute or voices were heard as soloists in the concerts; the other instruments were there only to accompany“. It was very rarely the case that any but musical performers were admitted to the concerts. The famous English music historian Charles Burney (1726-1814), was one of the lucky few to visit a private flute concert at Sans-sousi (he was permitted to hear the king’s music-making only trough a closed door to the private music-room). It was in 1772 at the very end of Quantz’s career. For his main project, the “History of Music”, Burney had to travel abroad to collect materials that could not be found in Britain. He noted that none of the performers except Quantz had the privilege of congratulating or criticizing the King’s flute playing. A smaller part of the flute concertos of Quantz was written in Dresden, and the rest in Berlin. When they were finished, his Berlin compositions were immediately copied, and two or three complete parts of each work were soon taken to the archives closest to the potential residences of the king. This is what the signs “pour Charlottenburg”, “pour Potsdam” or “pour Sans Souci” indicate on the title pages. During his time in Berlin Quantz also started writing. In 1752 his “Versuch einer Anweisung die flöte traversiere zu spielen” was published. It was dedicated to Frederick the Great. Quantz also wrote his autobiography which was published in 1755. In 1762 he wrote an handwritten continuation in Italian for Padre Martini’s “Storia della Musica“. In 1751 Quantz had become a member of the Berliner “Montags-Club”. The club was established in October 1749 by seven friends, among others lawyer Christian Gottfried Krause, poet Karl Wilhelm Rammler, Prussian officer and poet Ewald von Kleist, director of the philosophical section of the Berlin Academy of Sciences Johann George Sulzer and poet Johann Wilhelm Ludwig Gleim. Its mission was to achieve brilliant conversation and intellectual exchange, as well as to enjoy good fellowship. The club quickly acquired the character of an exclusive social club. Among the members who were added to its rolls were publisher Christian Friedrich Voß , musician Johann Friedrich Nicolay, poet, philosopher and critic Gotthold Ephraim Lessing, Jewish-German philosopher Moses Mendelsohn and music critic and theorist Friedrich Wilhelm Marpurg. Carl Philipp Emanuel Bach and Kapellmeister Carl Heinrich Graun were never members of the club but often participated in its social gatherings. The club can be seen as a centrum of the Enlightenment in Berlin and played an important role in the life of Quantz. It was probably there that he was inspired to write his “Versuch”. The first edition of Quantz’s Versuch was published by Christian Friedrich Voß. Quantz died on the 12th of July 1773 at Potsdam. The king erected a monument for him in the churchyard outside the Nauener Tor.